Election Committee upholds petition from MK Ahmed Tibi against distributing Charlie Hebdo; Liberman vows to stop 'terrorism' from within. The Central Elections Committee has upheld a United Arab List (UAL) petition against the distribution of the Charlie Hebdo satirical magazine in Israel, Channel 2 reports Wednesday. 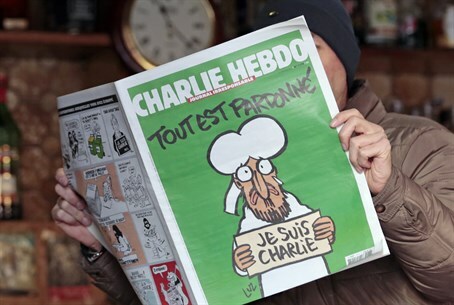 Arab parties have argued that the distribution of the issue, which features cartoons of the Prophet Mohammed on the cover, would spark outrage in the Arab sector; Yisrael Beytenu has been adamant that distribution of the magazine is legal under laws upholding freedom of expression. The petition was submitted to CEC chairman Justice Salim Jubran by MK Ahmed Tibi (Balad) and attorney Osama Baoudi, who is #12 on the joint Arab list, specifically against Yisrael Beytenu and its chairman, Foreign Minister Avigdor Liberman. Tibi and Baoudi expressed great satisfaction with the upholding of the temporary injunction. "This is not freedom of expression but a violation of religious symbols, which is forbidden even under Israeli law," they stated in a joint statement. "This decision sets a precedent and this is a victory for us, for sanity over extremism and racism, and a slap in the face to Liberman and his Yisrael Beytenu party." Israeli book chain Steimatzky dropped plans for an in-store promotion of the Charlie Hebdo edition after Arab parties expressed opposition to the move, a decision which drove Liberman to only strengthen his campaign to distribute the magazine in Israel. Yisrael Beytenu politicians and activists staged protests over the issue, and Liberman has been vocal over his defense of the right to freedom of expression. "Anyone who threatens security deterioration and dire consequences [because of the magazine] is not too far from that," Yisrael Beytenu representatives told Channel 2 Wednesday night. "No article sheds blood, and no article justifies bloodshed, nor actual threats." Representatives later clarified that stance as well, adding that in any event, it would not have violated elections laws due to the fact that it would not be handed out for free. Regardless, "it is better that the streets will burn and instead of people getting used to living in fear in their own country," Yisrael Beytenu said. "Burning streets are a solution; for people who are afraid, the solution is far more complicated. This is the message, which is a clear message that should be adopted by everyone who seeks democracy in its pure and true form." "A person should be able to publish anything legally, without fear for his life or the lives of others in the country," the representative added, noting that any other answer is an affront to democracy. Despite the ban, the party is still carrying out its intentions to distribute the magazine, as it announced on its Twitter account. At a Yisrael Beytenu briefing carried out by staff before they plan to distribute the newspaper in Tel Aviv Thursday, former journalist Sharon Gal spoke about the necessary to defend the freedom of the press. "We are handing out the papers not as an act of defiance, and not that we have anything against Muslims," he maintained. "We think it is necessary to respect all religions, and we want to honor the Jews. We do it in the name of freedom of expression." "This is another way to transfer the magazine to the public and it does not allow Arab leaders in Israel to terrorize the public and violate the freedom of expression, and the nature of Israel as a Jewish and democratic state," Liberman added.